This breed was established in 2000. 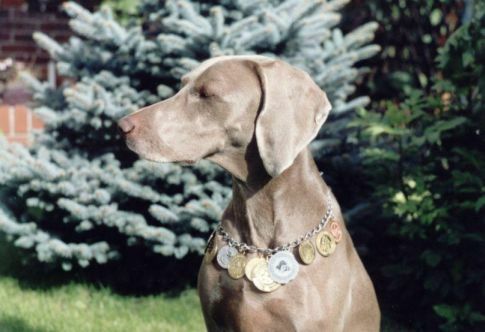 The Weimaraner is a medium-sized, well-muscled and powerful-looking grey gun dog, with fine aristocratic features. It is a friendly, fearless, alert obedient, bold and loyal dog, but it is also headstrong. The Weimaraner is an excellent guard dog, because of his inborn mistrust of strangers. It is the only one among all gun dogs, which can be trained. Weimaraners are prized for their features of guard dogs and perfect sense of smell, which is considered to the one of the best in the world. Because of that, Weimaraners are often used by the police. The fundamental disadvantage of this breed is it's obstinate and strong personality. This is a breed that definitely needs obedience training to control his rambunctious nature. That is why we recommend these dogs for people, who already have some experience with breeding.